The scenic layout for this presentation is of a specially modified 6’ x 12’ felt underlay (I use felt underlays for 15’s and ScenoSquares for 25’s) which has painted on fields and textured grasses in relief. It is enhanced with a considerable number of “plop-on” vignettes mounted on 3/16” beveled edge Gator foam free-forms featuring Civil War farm buildings, plantations, homes and other structures in attractive terrained vignettes. There are also forest/woods areas utilizing a concept of a “ring” of trees” depicting out-of-the-woods/ woods edge/ and within the woods. Figurines outside the woods cannot interact with those within the woods. Only those on the edge-of-the-woods may interact with those without and within. These forest scenics are built in the same manner as the structures by being based on 3/16ths beveled Gatorfoam. A large number of cast metal fences and walls in varying styles are provided. Tree-lines of metal and foliage are added for field edges. There is a river of four sections and 4 bridges. Completing the terrain are a number of ridges and farm fields –all of these with a large number of trees in scale truly depicting Northern Maryland and Southern PA (the flatter, more rollingareas ) in a most appealing manner. From an organizational standpoint, the Army of Northern VA is represented by Longstreet’s I Corps and Jackson’s II Corps. Each Corp has two divisions and each division has two large brigades representing specific Southern States. 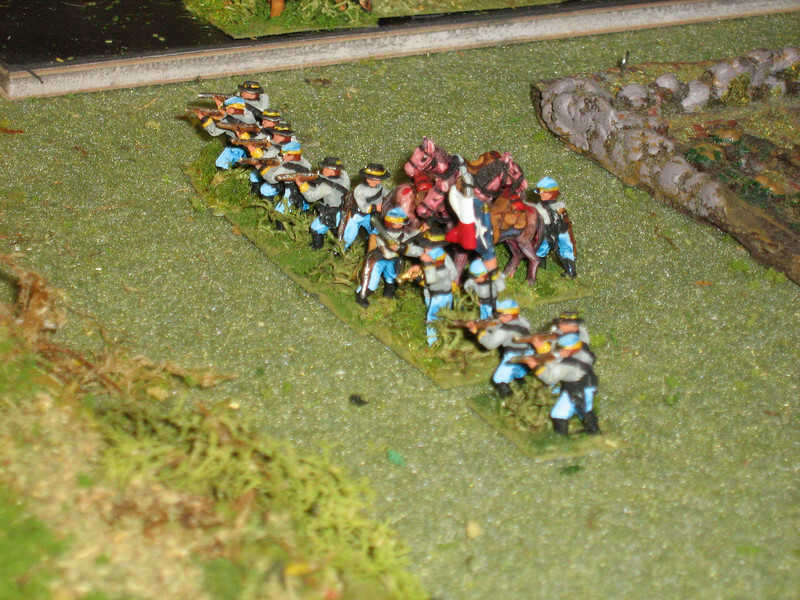 Cavalry is commanded by JEB Stuart and ArtilleryBattalions by Alexander. This is the Army of 1862 and Robert E. Lee is commanding. George Meade is in charge of the Army of the Potomoc which offers I, II & VI Corps: Each of two divisions - which in turn - each have two brigades. They are in general smaller brigades then the Confederate Units. Cavalry in this army is commanded by Buford, while Hunt has the Artillery. I will supply an organizational chart to better describe the contending armies. It is headed: DIXIE – American Civil War Game Organization and will come in a separate email. I have devised a relatively simple set of rules for playing in this 1862 period entitled: DIXIE – A game of the American Civil War 1861-65. There are at present four sheets covering the game. The first two deal with the concept and are titled Prologue to DIXIE. The actual rules are covered in another two sheets titled DIXIE – a game of the American Civil War. These will also be sent as separate emails. 4 ridges (24” x 6”), 5, fields (12” square), 4 woods (assorted sizes from 18” to 8”), 4 river sections (2’ x 8” and winding) with 4 bridges,4 extremely detailed Civil War dioramic farm Vingettes complete with barns, main houses, outbuildings, crops, flowers and trees (fully terrained), 9 “rubber” crop fields, 3 small hills, 3 small log cabins, 1 “rubber” outcropping, 22 tree line strips with full foliage, 1 foilage crops, 70 cast metal fence sections (2 styles), 16 large hedges &15 small hedges (cast resin), 14 cast metal stone wall sections, a whole camp of tents in two styles (Officers & Men) and a 6’ x 12 ‘ felt underlayment with painted and terrained fields and roads plus an additional unfinished section of felt to extend the table to 16’ x 6’.